The Woodbridge Rotary Club recently honored Amity High School senior Christina Emmerthal as Student of the Month for November. 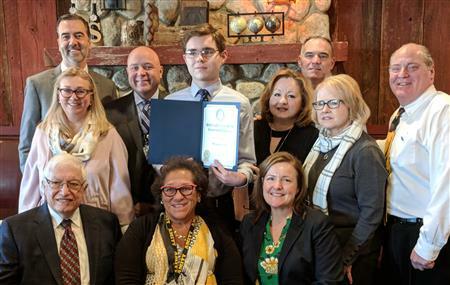 Each month, the Woodbridge Rotary Club and Woodbridge Social Restaurant partner to honor an Amity High School Student on a monthly basis. Opioid abuse is a hidden but increasing epidemic, especially in the suburbs (like ours). Teenagers, their parents, and concerned residents are all invited to attend a screening of the 45-minute documentary, “Chasing the Dragon”. Members of FBI, local law enforcement and drug-addiction specialists will also be attendance to answer questions. Rotary will honor all 2015-2016 Students of the Month from Amity whom the Club selected this past academic year. There will be food (including strawberries), drink, music, and fun. More than two hundred enjoyed an evening of delicious food and wine while we raised nearly $10,000 for local charities committed to end hunger. The Rotary Club of Woodbridge will sponsor AMBER Alert ID Project at Massaro Farm's Family Fun Day on October 11th. The Rotary Club of Woodbridge will be kicking off its annual Coat and Clothing Drive on October 1st. The Rotary Club of Woodbridge celebrates its Fifth Friday of the Month by honoring its annual Business of the Year.